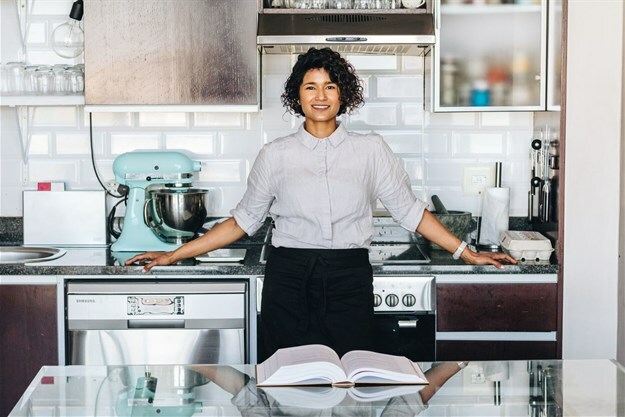 MasterChef SA season two winner and all-around local foodie celebrity Kamini Panther launched her new chef-inspired, healthy food delivery service FÜDY through Uber Eats at the beginning of this month. Aiming to supply healthy, ethically sourced and primarily plant-based meals to Capetonians, Pather aims to take the hassle out of creating or sourcing healthy meals. The initial launch caused some confusion and general backlash from the vegan community as the concept was promoted as plant-based via various platforms, however, chicken and fish meals are also offered. Pather quickly and graciously rectified this misconception and hopes to slowly introduce consumers to a more plant-based diet, we chat to her for #EntrepreneurMonth to find out more. What inspired you to start your plant-based food delivery service? It isn’t a plant-based service, but there are plant-based menu items. The idea for FÜDY came about through a real personal need. I wanted a food delivery service that catered to my want for healthy, convenient meals. Since winning MasterChef, my food experiences were insanely indulgent. My life changed when I was invited to be one of the ambassadors for the Cape Town Marathon three years ago. It was when I started training to run a full marathon, 42.2km, that my need from my food changed. I have run two marathons since and many half marathons, including the Berlin Half, so my diet has stayed with the macronutrient focus. This brand was made for people who understand subtle flavours in food, which would make them a “foodie”. It’s a play on that word. There seems to be some confusion around the marketing of the brand, why state that it is plant-based if meat is still offered, it just seems a bit misleading. The confusion lay in the phrasing and usage of the term “plant-based”. This menu was designed with plant-based eaters in mind because I see that plant-based eaters get a raw meal with food that lacks real flavour and innovation. The bases, sauces, and vegetables are all 100% plant-based but a person can change that direction when choosing a protein. There are five proteins, two of which are animal-proteins - free range chicken and sustainably sourced trout are the animal-proteins with the others being black beans and quinoa falafels, chickpea and nigella seed smash and crispy tofu. Why not create a purely vegan plant-based food-delivery service? I would imagine there is a serious gap in the market for this? While this is a major global trend, the trend hasn’t reached mass levels here in SA. This is service is also personal and I am not vegan. I eat a 70-80% plant-based diet but I do eat locally and consciously sourced animal-based proteins. How do you source your suppliers and ingredients? I work closely with suppliers who are leaders within their categories - fresh produce, free range chicken and sustainably sourced fish. They are mindful about how their produce is farmed; a mindfulness that is passed onto FÜDY. Can you explain how the ghost kitchen concept will work? The ghost kitchen/dark kitchen/digital kitchen is a concept that is big internationally and refers to a kitchen which only caters for delivery service. There are multiple brands that share the space, overheads and staff. Without the retail aspect of the business, it means that the operating costs are much lower. For someone like me, it means that the start capital needed to start my business were more attainable. How do you plan to take FÜDY international? International is a still long while away. The idea is to set up multiple hubs in SA. Once we have the national market serviced adequately, we can start to think about expanding into other developing nations where this type of service isn’t available just yet. How do you personally and professionally live a more eco-conscious way of life? Personally, I try to walk around Cape Town as much as possible and not use my car. My building separates our garbage making it easier to recycle. I save water by keeping my showers to a minimum and collecting the water while the water temperature is heating up. I always have a reusable carrier bag for my grocery shopping. Professionally, FÜDY uses compostable packaging. We minimise wastage by trying to use all by-products e.g. the butternut seeds are popped and used as a garnish. Can you tell us more about your Bagasse food containers? Bagasse is a waste product from the sugar cane industry. It is the pulpy waste collected from extracting the juice from sugar cane. It was once used as a biofuel but now forms a major component in the packaging industry. From my experience, they tend to retain heat well. What did you learn from competing in MasterChef SA? Always keep a cool head in sticky situations. The MasterChef kitchen is as stressful as it is portrayed on TV. In those moments of high pressure, the only way to survive is to keep your wits about you and power through with quick thinking and measured thinking. How has winning it changed your life? Winning has completely changed my life. I was the host and producer on a food-travel show, Girl Eat World, that was broadcast to the Food Network and Discovery World globally, as well as Netflix North America. It allowed me to do the things that I love to do - travel, taste amazing food, and meet fellow bloggers. Winning Masterchef increased my public profile and gave me a voice within the industry making it easier to collaborate with brands and create my own opportunities. One of those opportunities is FÜDY. Your ultimate guilty pleasure when it comes to food? Gelato. I am obsessed with Moro Gelato’s tiramisu and marchese flavours. My grandmother has been a major inspiration in my food journey and one of my best memories is sitting on her porch with my brother and cousin, eating orange segments. After we had eaten the flesh, she cut teeth into the peel which we wore as our orange smiles. What advice would you give to aspiring local entrepreneurs? The food industry is notoriously challenging. A cliche is to “follow your passions and dreams”, however, in this industry, often that is a given. What is often neglected by many aspiring foodie entrepreneurs, is the many moving parts and financial savviness required for longevity. Financial models need to be rock solid, daily moving input costs need to be tracked continuously and fair margins need to be maintained. Lastly, it is vital that adequate cash flow has been allowed for, to survive the infamous first 12 months and beyond. What major food trends do you predict for 2019? Fermentation, which has been on the rise for a while will continue to be popular. I’m thrilled by more kimchi and sauerkraut, as a starter. Plant-based and veganism will continue to increase in popularity. Insects will make their way to your plate. Learn more about FÜDY by following @FudyDelivery on Instagram and visit fudydelivery.co.za.